As in the title: i would like to know why “Odrive Finder Extension” process consumes 22% of my cpu without synchronization process active? The odrive Finder extension may be reacting to other Finder or filesystem activity. Is there anything else taking up noticeable CPU at this time, besides the Finder extension? If you toggle the extension on and off via System Preferences -> extensions, does the CPU load subside? No sync process active no other finder acitivyt. If i toggle off the extension and odrive app, this “odrive finder extension” appears again. Do you see that the odrive Finder Extension is using this much CPU at all times, or only sometimes? Can you send a diagnostic from the odrive menu so I can take a closer look? Unchecking the odrive Finder Extension in System Preferences should stay unchecked until odrive is restarted. When odrive is started the Finder extension is started again. Are you seeing that it is re-enabled on its own, without an odrive restart? This “odrive finder extension” run all time, also when odrive app isn’t active on system. yes it is re-enabled on its own, without an odrive restart. This is strange behavior. How long does it take for the extension to become checked again after unchecking it? 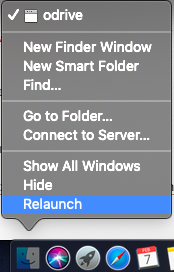 If you close all of your Finder windows and relaunch Finder (To do this: Hold the ⌥ (alt/option) + right click on the Finder icon in your dock -> Relaunch) does the CPU remain high? 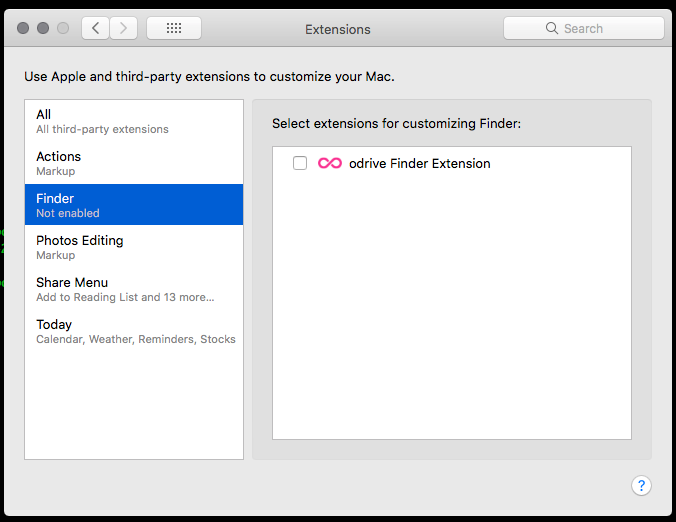 Do you have any other Finder extensions loaded? If so, can you unload (uncheck) those and see if the behavior changes? odrive finder extension is always present in Activity Monitor with 10%/12% of cpu usage. I haven’t problem with OSX Tab Extension where it reamain always checked. After Finder Re-lunch on Acativity Monitor “odrive finder extension” reaper immediatly with same cpu usage (about 12%) also if odrive app isn’t active. I haven’t problem with OSX Tab Extension where it reamain always checked. Are you able to uncheck it? Please uncheck the odrive Finder extension and leave it unchecked, if possible. 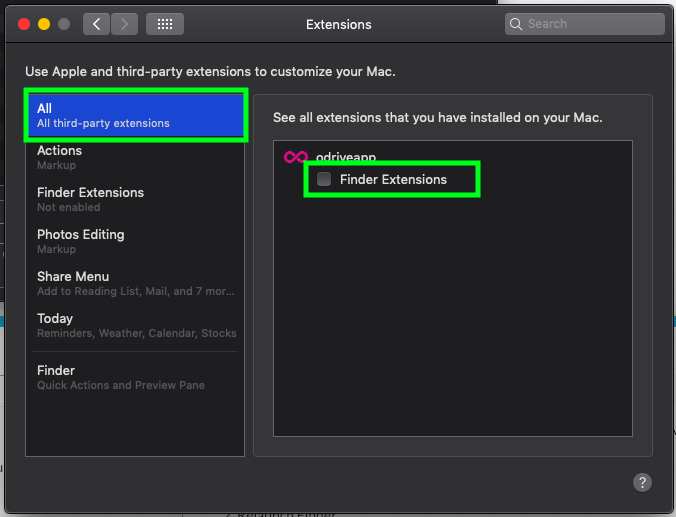 Uncheck the Finder Extension, so it is not enabled in extensions. In Activity Monitor, if there are still odrive Finder Extension processes, kill them. This should get rid of that troublesome Finder extension that is causing high CPU. I want to make sure these steps can be performed and the extension is killed before we do more testing. Can you also tell me if you have any other Finder extensions installed? Are there any more extensions listed besides the odrive extension in the Extensions screen? r, if there are still odrive Finder Extension processes, kill them. if i uncheck odrive finder extension from system settings and reluch finder, from task monitor i haven’t cpu problem. But without finder extension actived i can use odrive in the same way? Basic odrive functionality will work without the Finder extension. odrive will still automatically sync your locally-changed files, update remotely changed files if you have them synced locally, download files when you double-click them, expand folders when you double-click them, etc. You will not be able to right-click->sync a folder or perform the other right-click actions and you will not see sync badges. Are there any other extensions listed besides the odrive extension in the Extensions screen? Unfortunately we are not able to reproduce the type of behavior you are seeing here. It seems like it may be something specific to your environment that is causing this, but I don’t know what that could be. Can you take a screenshot of your extension window (like the one below), and post here so I can make sure it looks correct? No, only the app and one/two or three odrive finder extension. Aer you still running version 10.13.3? Are you able to update to the latest version, 10.13.6? I don’t know if it will help this particular issue, but I am just looking at things that are different between our machines here and yours. Our High Sierra machines are running 10.13.6 and not exhibiting this behavior. ok, thanks. i have 10.13.3 osx version. i’ll update.